Traveling with kids can be tough. For someone like me, who is prone to overload the agenda, it often means a degree of flexibility I am not accustomed to. We still want to eat good food, see things that interest people older than five and stay at nice places. 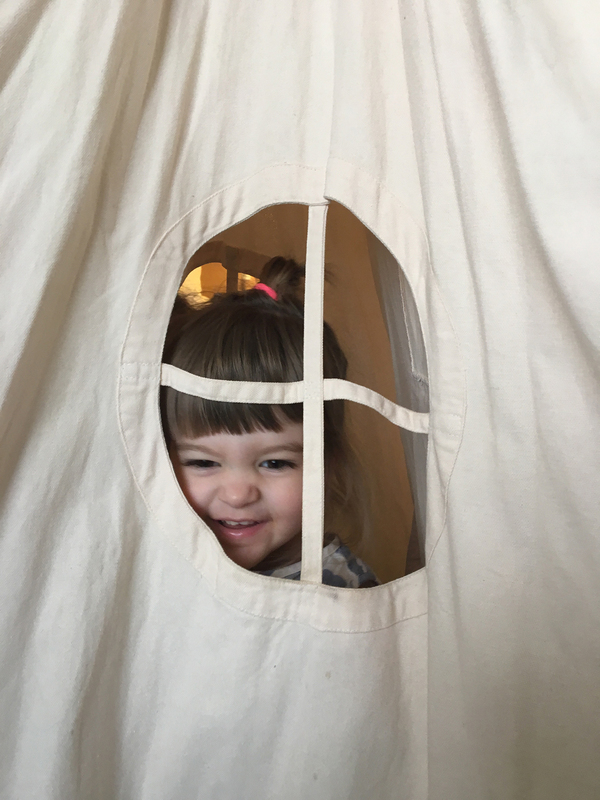 There are very few places that outright don't allow kids (not saying those aren't a necessity sometimes), and lots that accommodate them but it's rare to find somewhere interesting that actually goes out of their way to welcome them. In that regard the 21c Museum Hotel in Cincinnati shines. We were looking for a doable day trip for my birthday and have been wanting to check out the Cincinnati 21c since it opened. 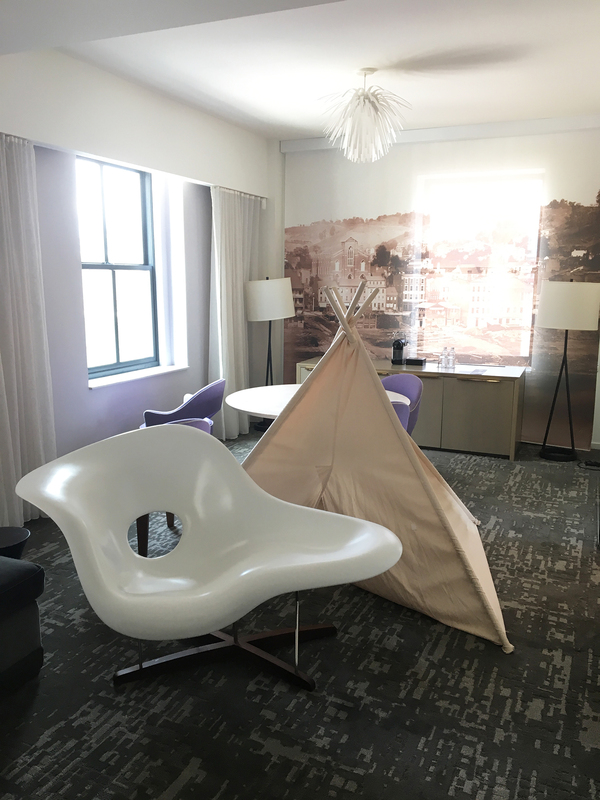 They offer a kid's exploration package which includes tickets to the Newport Aquarium, milk and cookies (and there was wine, not sure if that was just a birthday thing or not) and a teepee in the room. If you're familiar with the brand there are penguins everywhere. Our daughter immediately took to spotting (and hugging) as many as she could find so it was an amazing surprise when someone from the hotel brought one up for our room. Speaking of penguins, the woman that checked us in had a great on brand (but not branded!) temporary tattoo for us as well. A lot of amazing, immersive brand experiences get absolutely ruined when the brand thinks they'll get an ounce more mileage by adding their name or url to something. I'd show you the finished product but it wasn't the best application so I'll just stick to the praise of the experience. They not only allowed us to pick up the aquarium tickets in the morning before our check in but also check in early for nap time. 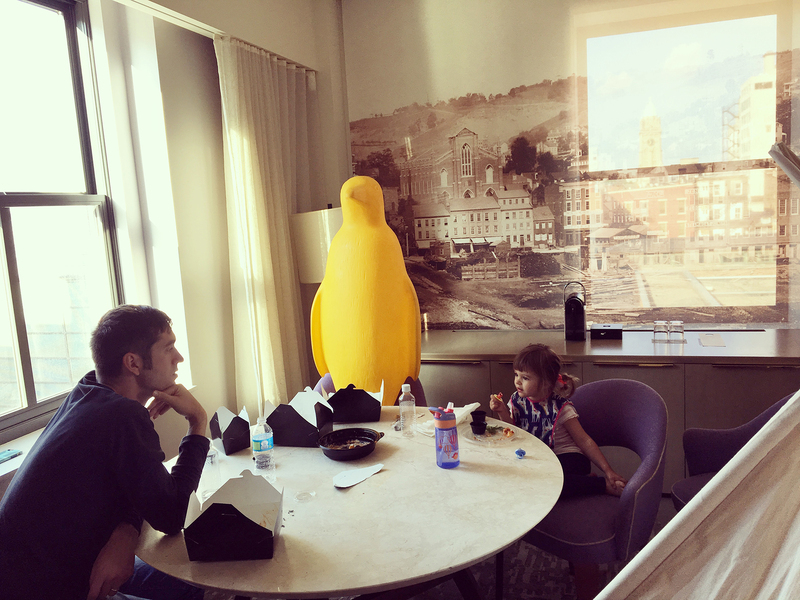 Of course Emma's first hotel stay, in a hotel with magical plastic creatures everywhere did not net us an actual nap, but it allowed us to set up our base early. 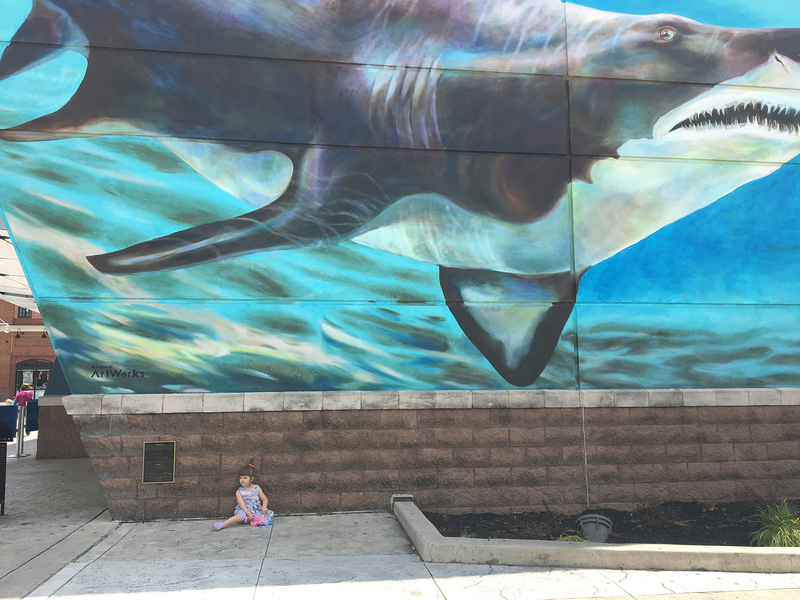 The Newport Aquarium is amazing. I went to the Shedd Aquarium in Chicago a lot growing up and it's my only real comparison. The Newport is probably a third of the size by my estimation but it feels a lot more approachable and friendly. The crowd size, ease of parking, and on-site dining options make it a clear winner to me for younger kids. You can see the whole thing in a few hours and it's a really interactive space with several opportunities to get hands on with creatures. The Stingray Hideaway is really cool. 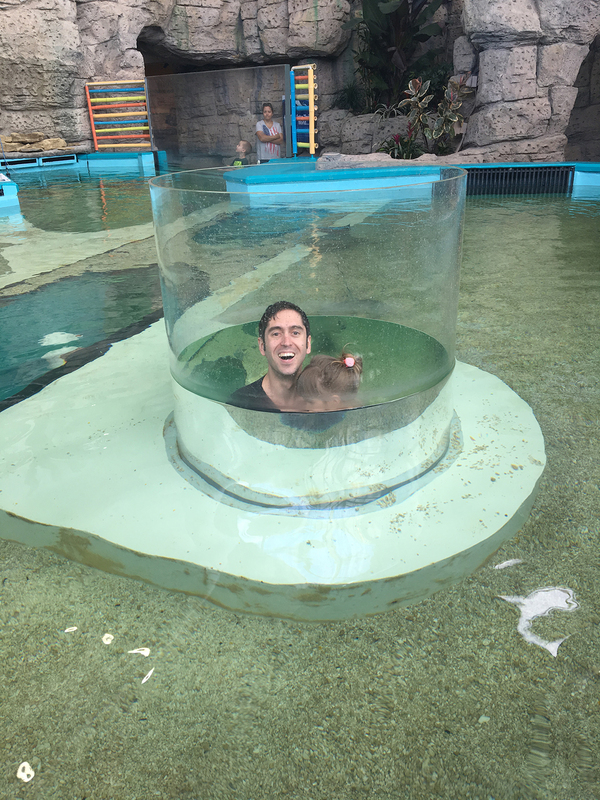 It's a kid sized cave that snakes through the stingray tank and opens up with this hole in the middle of the tank you can pop out of. 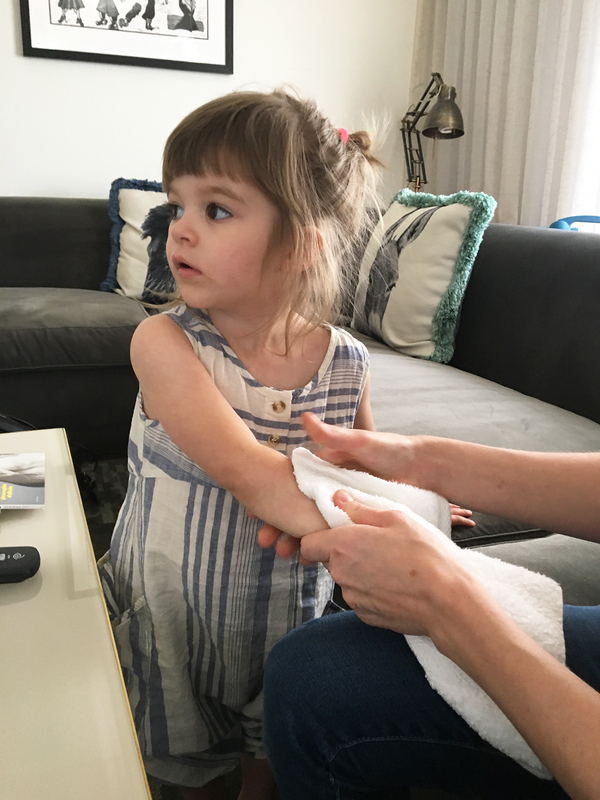 Despite this picture I swear there was a whole fever (see that thing I learned there?!) of stingrays in this thing. 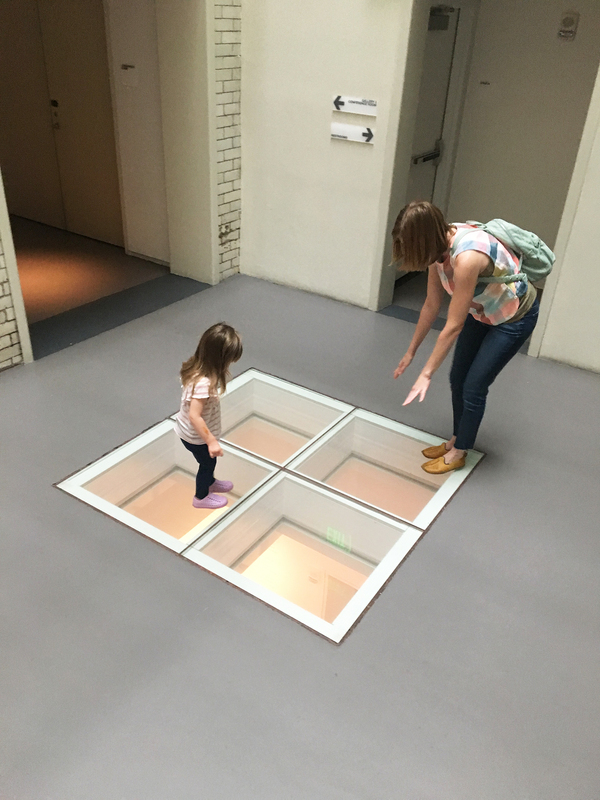 They have these amazing tunnels that serve as both transitions and exhibits themselves. 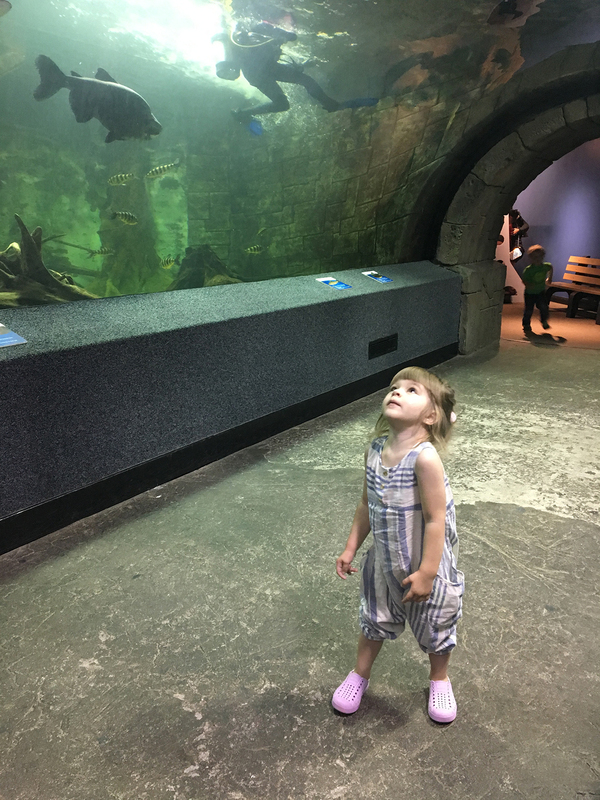 We happened to be there at feeding time and the kids were at least as enamored by the scuba divers as they were by the fish. The tour ends with the much advertised "Shark Bridge." If, like me you are equal parts impatient and claustrophobic, the Shark Bridge is a real nightmare. 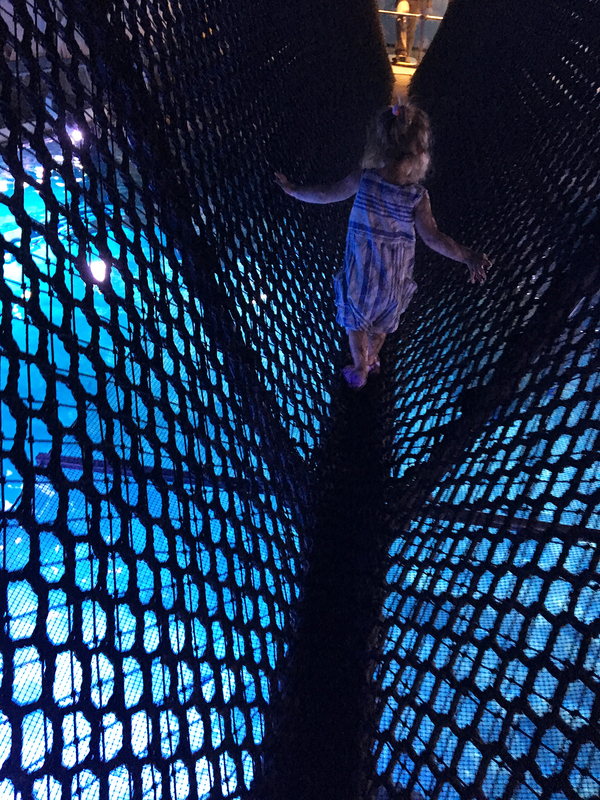 You are not allowed to carry your kids on it and it turns out that a seemingly endless stream of 2-5 year olds takes a really long time to cross a 75 foot rope bridge over a shark tank. Luckily she didn't ask to do it a third time. There is a decent mix of chain restaurants throughout the development around the aquarium. For a cheaper, quicker, and I think better, option there is also a hotdog stand and a great view of the river. Once we accepted our nap reprieve was not to be we took off for Over The Rhine. For readers outside of Central, Ohio, OTR is one of the country's fastest and most successful (making no statements one way or the other on the ensuing gentrification argument there) transitions from what was literally the "most dangerous neighborhood in the country" to a thriving district of independent shops and restaurants. 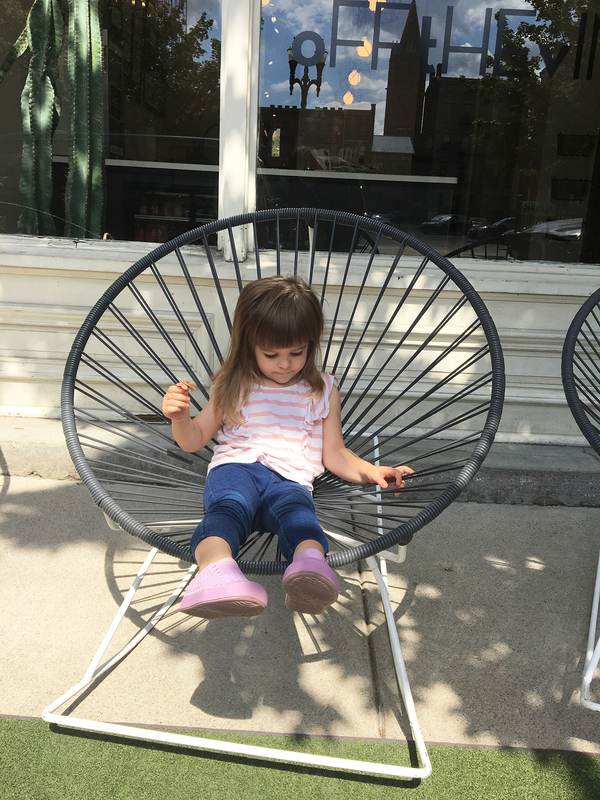 Emma is sitting here on the darling chair set up outside of Off The Vine cold pressed juice bar. Be sure to also check out Sloane Boutique for an amazing women's selection, Article Menswear,MICA for great gifts and lots of locally made items and you can't miss out on the best Belgian waffle of your life from Taste Of Belgium. 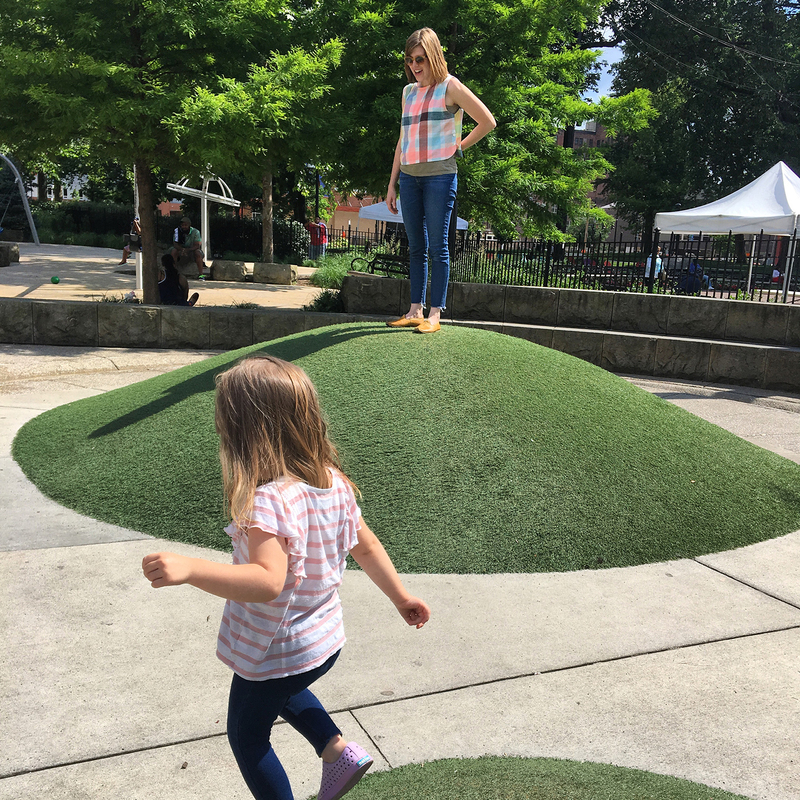 WashingtonPark is one of the crown jewels of the OTR redevelopment. It has some seriously amazing play spaces and even had staff onsite interacting with kids. 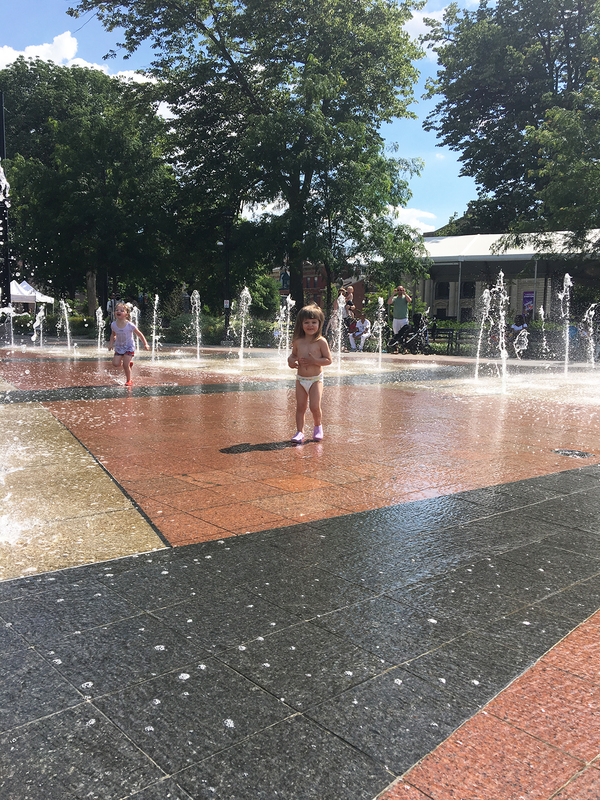 There is an amazing playground, really cool dog park, splash-pad and they do other great programing and concerts throughout the year. We really meant to take the streetcar back to the hotel from the park, after missing one and deciding not to wait another 12 minutes we somehow decided to walk a mile in 90 degrees with a 2.5 year old who didn't nap. Take the streetcar back. Still we weren't quite ready for dinner so we burned a little more energy and time roaming the wonderful gallery space. We had our sites set on Sotto for dinner. The food and space are both incredible and it's a stone's throw from the hotel. Not wanting to inflict our no-nap, worn out kid on people wanting an evening in an upscale, hidden restaurant we opted for take-out. They don't actually let you call in take out orders, but as it was Negroni Week, I decided I could take one for the team and order to go from the bar. 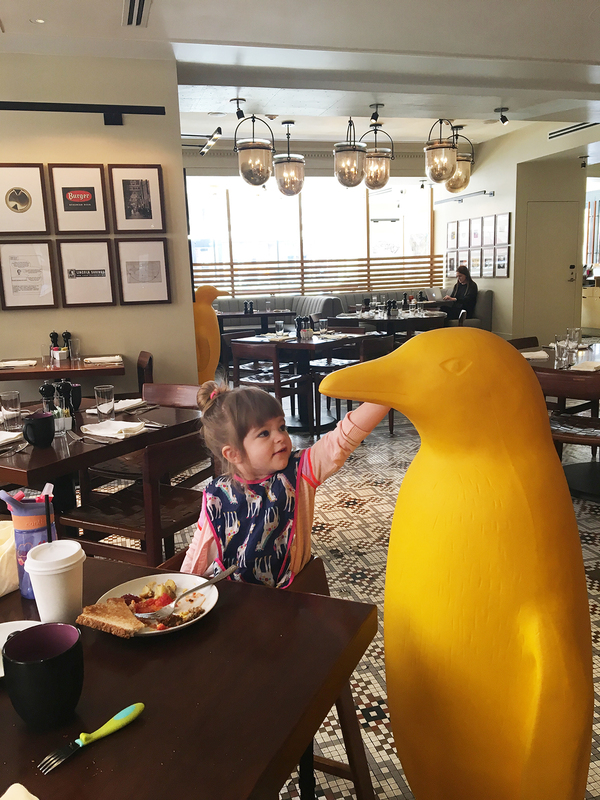 A quick breakfast at the hotel restaurant, some more penguin spotting, and we were all set to leave the Queen City almost exactly 24 hours after we arrived. 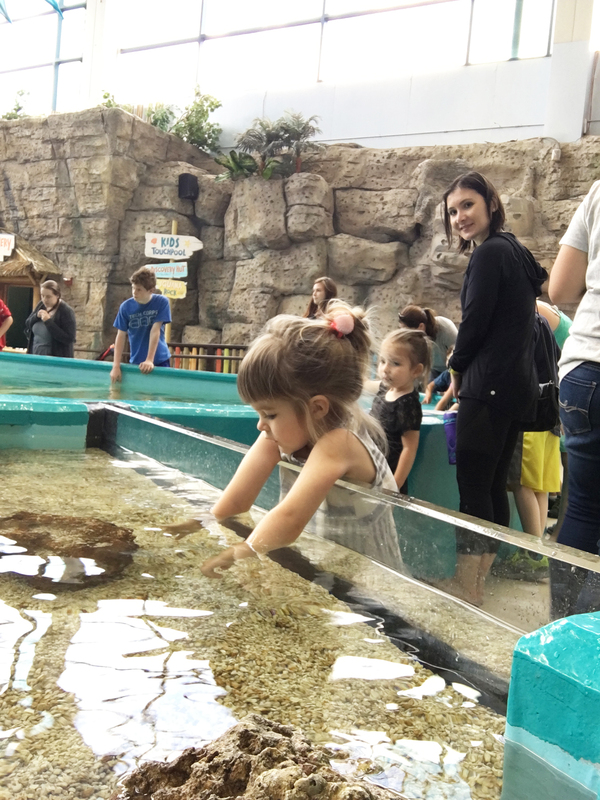 If you are anywhere within a couple of hours of Cincinnati this is a doable, 24 hour excursion that is sure to delight parents and kids of any ages. It's nice to find businesses like the 21c that realize that kids are people too and that parents still like color and joy.